Textile mills are learning how to cut costs and pollution. Daniel Chinoy reports from Changshu, Jiangsu. The 25 textile mill managers gathered at the Shang Lake Garden Hotel earlier this week buzzed with energy, shooting off orders to subordinates on their cell phones, exchanging name cards and then greeting each other like old friends. A set of mostly self-made entrepreneurs with little formal education but an excellent business sense, they had come to learn new ways to improve efficiency, cut costs and increase profit at their mills. But the speaker they were waiting for was not an expensive management consultant or corporate lawyer. Instead, it was Linda Greer, a scientist with frizzy hair and a PhD in environmental toxicology. An expert with the Natural Resources Defense Council (NRDC), a New York-based non-governmental organization, Greer made the trip to the conference in Changshu, a picturesque city in Jiangsu province, to introduce the Responsible Sourcing Initiative - a best practice guide that textile mills can use to reduce their water, chemical and energy use. If widely implemented, she argues that these techniques can transform the textile industry - and make it more profitable at the same time. "Our experience showed that most mills did not even realize how much money they were throwing away. And when you waste water, energy, and materials, you are polluting the environment," she told the conference, which was jointly organized by the Changshu government and the NRDC. "So that is the win-win we can get here: improving resource efficiency in a way that you can reduce costs and protect the environment at the same time." There are roughly 50,000 textile mills in China - more than 100 in Changshu alone - producing everything from pillows and blankets to clothes, bags and even fabric used in car interiors. Despite a large drop in demand as a result of the economic crisis, China exported nearly $160 billion in textiles last year. Changing the way the nation's textile mills operate is clearly no easy task. 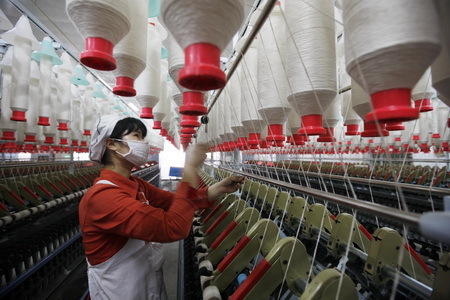 "Textile production is one of the most polluting industries in China," Greer told China Daily. "People don't think of this as being a heavy industry, but when you look at the energy and water consumption, it really is." In the process of making clothes, mills emit what she calls a "noxious brew" of chemicals, and use enormous amounts of energy and water - up to 200 tons just to make 1 ton of fabric. Factory managers in China also still have many incentives to disregard "green" concerns. Local government officials often do not enforce environmental regulations in order to boost production and GDP figures. Relentless demands for cheaper prices from multinationals like Wal-Mart also leave factories reluctant to spend money on sustainability. After all, "there are a lot of ways to be more efficient that are not necessarily more environment friendly", said Meghla Bhardwaj, associate editor-in-chief at Global Sources, a consultancy that helps connect companies with potential suppliers. However, fierce competition and growing consumer pressure are beginning to force suppliers to take environmental issues more seriously, said Bhardwaj. "More and more suppliers are realizing that eco-friendly measures such as recycling andwaste reduction can help lower their production costs and improve profitability." "Factories in China are increasingly focused on efficiency," added Wang Hua, director of the ecology department at the Jiangsu Environmental Protection Bureau. "The government's environmental regulations are increasingly strict but factories are also looking for ways to reduce their costs."